Preserved Henschel 25657/1946 was originally built for the Farge-Vegesack railway. Sold to the Bremen-Thedighausen railway in 1965 and then to Rinteln-Stadthagen railway in 1967, it was finally transferred to the railway museum in Darmstadt-Kranichstein and displays the livery of its last operator. Photo taken by Hugh Llewelyn on June 4, 2011 (source: www.commons.wikimedia.org). Side drawing of TKp30 from PNPP. After WWI the Liegnitz-Rawitscher Eisenbahn standard-gauge private railway, opened in 1898, was divided in two by newly-created border. Liegnitz remained in Germany and the other terminal station, Koppelstädt, became Kobylin. Polish section of this railway, between Rawicz and Kobylin (33 km), was not incorporated into the PKP state railways, but remained in private hands and was operated by the Rawicz-based Polskie Przedsiębiorstwo Kolejowe (Polish Railway Enterprise). In 1929 two new tank locomotives were ordered from the First Locomotive Factory in Poland of Chrzanów (Fablok). These had factory designation T1D (sometimes written as T-1-D) and were not an indigenous design, but a variant of German ELNA 6 type. ELNA stood for Engere Lokomotiv-Normenausschuß, a committee set up in Germany in the 1920s to develop a family of locomotives for branch lines and private railways, so that a measure of standardization could be achieved. In all, six basic ELNA types were developed, each in two versions running on saturated and superheated steam, respectively. 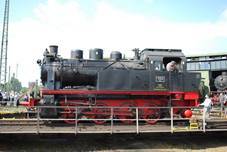 Of these, ELNA 6 was the heaviest and most powerful, and turned out to be the most prolific one: standardized as KDL4 (Kriegsdampflokomotive, or wartime steam locomotive) during WWII, it was built by several German railway stock manufacturers: BMAG (two), Hanomag (five), Henschel (24), Hohenzollern (four), Krauss and later Krauss-Maffei (eight), Orenstein & Koppel (one) and Vulcan (one) – 46 examples in all. Several orders were cancelled. In 1944 seventy KDL4s were ordered from French Schneider company, but only 67 were completed and all went directly to SNCF as class 040TX. Last two (some sources give three) engines of this type were assembled by Henschel from spares in 1946. New engines from Fablok were delivered in 1930 and assigned service numbers 183 (s/n 348/1930) and 184 (s/n 349/1930). They were straightforward, but robust and powerful for their size machines, running on superheated steam, with 0-4-0 axle arrangement and 1100 mm drivers, developing tractive effort of 9.75 tonnes. Maximum speed was set at 40 km/h. When the Rawicz-Kobylin line was purchased by PKP in 1935, Nos. 183 and 184 became TKp30-1 and TKp30-2, respectively. Taken over by DRG in 1939, they were re-designated once again and became 92 2601 and 92 2602. After WWII both engines remained in Western Germany with DB and were written off in December 1951. Some older Polish sources state that they were returned to PKP, which is incorrect. Similarly, some sources give that two ELNA 6 locomotives were used by PKP for a short time after WWII and later went to industry; most probably this is not true. According to Internet sources, at least three ELNA 6 engines have been preserved in Germany: BMAG 9963/1930 (Ebermannstadt), Krauss-Maffei 15721/1930 (Kassel) and Henschel 25657/1946 (Darmstadt). 1) Fablok production for PPK only. - ELNA-Dampflokomotiven by H. – M. Koenner (E. Kirpal, Essen 1977).